The 4-in-1 Pen Set is a tiny case that packs a big punch with 2 ball pens (blue and red ink), 1 yellow highlighter, and 1 mechanical pencil. 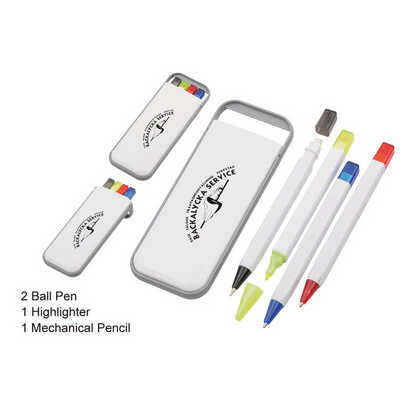 The white and grey case may be personalized via digital printing, and is made from high quality ABS Material - ABS Colours - Colour: White with Grey Product size - Item Size: 13x5x1.4cm Print size - 2x8cm. Price includes : 2wk 1 col/pos print. Setup is included.